An anthology of the world's best literary espionage, selected by a contemporary master of the genre, Alan Furst. Here is an extraordinary collection of work from some of the finest novelists of the twentieth century. Inspired by the politics of tyranny or war, each of these writers chose the base elements of spy fictionhighly evolved spy fictionas the framework for a literary novel. Thus Alan Furst offers a diverse array of selections that combine raw excitement and intellectual sophistication in an expertly guided tour of the dark world of clandestine conflict. These are not just stories of professional intelligence officers. We meet diplomats, political police, agents provocateurs , secret operatives, resistance fighters, and assassinsplayers in the Great Game, or victims of the Cold War. 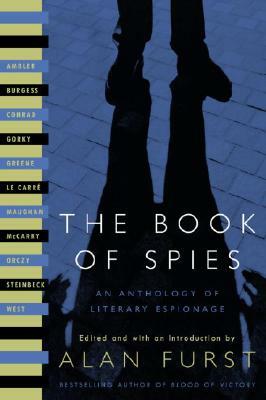 The Book of Spies brings us the aristocratic intrigues of The Scarlet Pimpernel , in which French migrs duel with Robespierre's secret service; the savage political realities of the 1930s in Eric Ambler's classic A Coffin for Dimitrios; the ordinary citizens (well, almost) of John le Carr's The Russia House , who are drawn into Cold War spy games; and the 1950s Vietnam of Graham Greene's The Quiet American , with its portrait of American idealism and duplicity. Drawing on acknowledged classics and rediscovered treasures, Alan Furst's The Book of Spies delivers literate entertainment and excitement on every page. From the Hardcover edition.